Lady Liberty was off-limits on Saturday. Democrats and Republicans appear to have made no progress toward ending the federal-government shutdown on Saturday, unless you count persistence at blaming each other. As of Saturday evening, the position of both sides remained: “No, you cave.” For Republicans, that means insisting they won’t negotiate demands with Democrats until after they help reopen the government; for Democrats, that means insisting they won’t help reopen the government until after they’ve negotiated with Republicans. A vote to end the shutdown in the Senate is being planned by GOP leaders for early Monday at the latest, but Democrats say they can block it. In the meantime, the purportedly nonchalant White House is characteristically insisting that its shutdown is going to be the best shutdown, or at least better than the one GOP lawmakers forced upon the Obama administration in 2013. On Friday, Trump administration budget director Mick Mulvaney — who helped lead the hard-right, anti-Obamacare faction in Congress that pressed for the 2013 shutdown — accused President Obama of “weaponizing” that shutdown for political reasons. This time, according to Mulvaney, federal agencies will be empowered to use existing unused funds to remain as open as possible for as long as possible. Mulvaney also suggested that the Trump administration — which is attempting to shrink the government as much as it can, impressing no one with its management of federal agencies — was doing it for the workers. Whatever spin the White House comes up with, or whether they are able to keep public-facing institutions like national parks open or not, many if not most of the hundreds of thousands of government employees who would normally be furloughed during a shutdown will still be furloughed during this one, particularly if the shutdown lasts a long time. Thanks to the shutdown, President Trump will not attend a big-bucks fundraiser at his Mar-a-Lago estate in Florida on Saturday night that was going to double as a party to celebrate the one-year anniversary of his inauguration. Trump had reportedly been worried that this would happen, not wanting the shutdown to interfere with “my party.” The party — which donors paid as much as $250,000 to attend — will now go on without him. Trump’s son Eric will take over hosting duties while the president sticks around the White House. Just in case you were wondering, the government shutdown should not have an impact on special counsel Robert Mueller’s Russia investigation. That investigation is funded by a permanent indefinite appropriation rather than the annual appropriation that Congress currently can’t agree on, so both Mueller and his employees will continue to go about their work. The House is now voting on whether Republicans can use a poster that says "Shutdown Schumer" on the floor. Looks like the White House is definitely negotiating in good faith! As of Friday afternoon, CDC officials hadn’t received any official guidance on how to respond to the shutdown. Vox reports that CDC staffers first received an email from the acting secretary of Health and Human Services telling them that the agency was “working to update our contingency plans.” Then, six hours before the shutdown, staffers were told whether or not they would be furloughed and asked to prepare for the possibility that the government would stop running. Anonymous staffers have expressed alarm at the lack of communication and the fact that there doesn’t seem to have been any kind of plan in place. “The fact we’re getting no guidance is symptomatic of the dysfunctionality of this entire [administration],” one CDC staff member told Vox. To their point, the last-minute confusion was apparently avoided ahead of the 2013 shutdown, when employees were informed of their furlough status as much as five days ahead of time. About 50 percent of HHS staff will likely be furloughed this time around, and the CDC will only be allowed to keep less than 40 percent of its staff. Late Friday, the CDC did decide not to stop tracking flu cases. The influenza-surveillance program, which tracks and issues weekly reports on the flu season’s progress, was halted during the 2013 shutdown but will only be slowed down during this shutdown because of this year’s particularly dangerous outbreak. At least 30 children have already been killed by the virus in the U.S. this season. ﻿A thorough Washington Post story in the “how we got here” genre makes it painfully clear that President Trump’s failure to articulate what he actually wants is a leading factor in the government shutdown. The fact that he doesn’t understand any of the policy involved isn’t helping. The piece documents the many recent instances in which Trump has made life unnecessarily difficult for his own party — like when he tweeted that the Children’s Health Insurance Program shouldn’t be funded in a short-term spending plan, then immediately agreed with Mitch McConnell during a phone call that it should be. This is almost certainly the first government shutdown in which the president isn’t really running the government. Will Trump Have to Get His Own Diet Coke? More important, it’s not clear if President Trump’s famous Diet Coke button will work for him during the shutdown. Alyssa Mastromonaco, a former deputy chief of staff for the Obama administration, told Politico that during the 2013 shutdown, there were no assistants or support staff, limited food, and she often found herself doing basic janitorial duties. Perhaps the president’s Diet-Coke butler can be classified as an essential staffer? 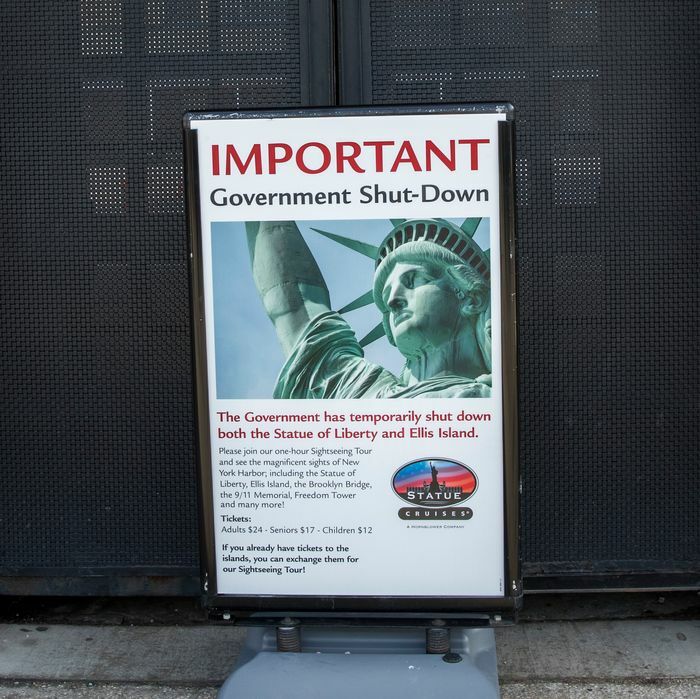 But on Saturday morning, New York City tourists got a rude awakening in the form of signs announcing that the Statue of Liberty and Ellis Island were closed due to the shutdown. We were quite close to an agreement last night, but the lack of clarity from the White House was the main problem. Senate R’s do not want to move legislation without POTUS approval. But getting clarity on the administration position is like trying to nail jello to the wall. Is the Senate coordinating to make Jell-O the official snack of the shutdown? Are Democrats in the pocket of Big Jell-O? Stay tuned. UPDATE: It turns out this is by no means a new thing. Schumer today: Negotiating with Trump is like negotiating with Jell-O. In a statement, the ailing Arizona senator said that the “hard reality is that all of us share responsibility for this failure,” and lamented the effect shutting down the government would have on the military. Senate majority leader Mitch McConnell and House Speaker Paul Ryan seem to be aligning on an uncompromising strategy: No discussion of DACA until Democrats agree to reopen the government. This goes directly against the previous positions of both men, but something tells us they won’t be losing any sleep. Republicans won’t negotiate immigration until Democrats reopen government. Democrats won’t reopen government until Republicans negotiate on immigration. We could be here for a minute. The Senate majority leader said on Saturday morning that he favors dealing with the all-important immigration negotation after the government reopens, which is unlikely to appeal to the Democrats who have already rejected that premise. Members also complaining to me that the House gym lacks enough towels this morning and they wonder if it’s because of the shutdown.